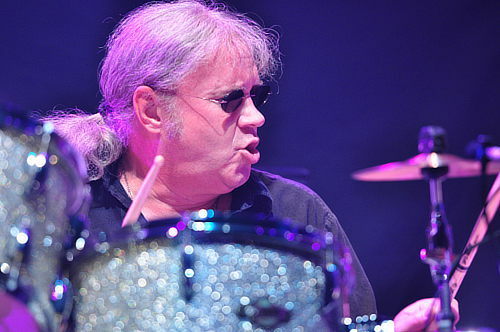 On Monday, May 20, Ian Paice will take will take a week long residency at London’s Ronnie Scott’s Jazz Club playing with the Buddy Rich Big Band. The event will be hosted by Buddy’s daughter Cathy Rich. One of legendary drummer Buddy Rich’s last requests of his daughter, Cathy, was to keep his band working, his music alive, and to do something for young people. No easy task, but eventually the idea of an annual memorial concert seemed like the best way to do it. Cathy Rich produced the first Buddy Rich Memorial Concert in 1988 at Carnegie Hall in New York and thus began the story of these incredible events. 2017 marks the 30th anniversary of Buddy’s passing and what would have been his 100th birthday and, following the success of the 25th anniversary memorial concert at the London Palladium in 2012, Ronnie Scott’s will be hosting 12 exclusive shows over 6 nights featuring the reformed Buddy Rich Big Band with legendary drummer Ian Paice (of Deep Purple fame), Buddy Rich Big Band drummer Gregg Potter, and the evening hosted by Buddy’s daughter Cathy Rich. The Buddy Rich Big Band will comprise musicians from both the US and the UK, several of whom toured with Buddy himself and played on his last ever UK shows in 1986. Join us in paying tribute to “the world’s greatest drummer” in his 100th birthday year! Posted by Nick Soveiko on Wednesday, February 6th, 2019, filed under News. You can follow comment on this post through the RSS 2.0 feed. You can skip to the end and leave a comment. Pinging is currently not allowed. Any chance of it being recorded for a dvd? Steve Bone …. I’m a huge fan . I saw him present a drum clinic at Newcastle Labour Club in the early 80’s ( post Gary Moore , just before Deep Purple reformed ) . These shows should be great. No easy task and I’d imagine a lot of rehearsals to be done, we’re talking Buddy Rich after all. I’ve always wanted to see Paicey play more big band music, he is in my opinion the Buddy Rich of rock. Hopefully this will be filmed for those of us who can’t travel to London. As Ronnie Scotts is an intimate jazz club the tickets are selling fast. Should be a great series of gigs and a chance to watch the great man up close ! What a marvelous event to commemorate such a brilliant drummer. So Happy………Ronnie Scotts is a great club for shows……..Jeff Beck recorded a live show there, great atmosphere there. Ian Paice can play all types of music, he brillant.